10 years ago I was doing genealogy research with my father on our Oxenbold line. We were tracing the family of Richard Oxenbold from Knighton-on-Teme, Worcestershire, England. 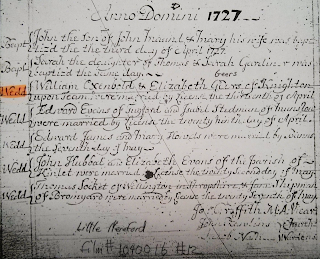 According to his 1728 Christening record his parents were William and Elizabeth. There were other children later, but this was the earliest mention of children to that couple. 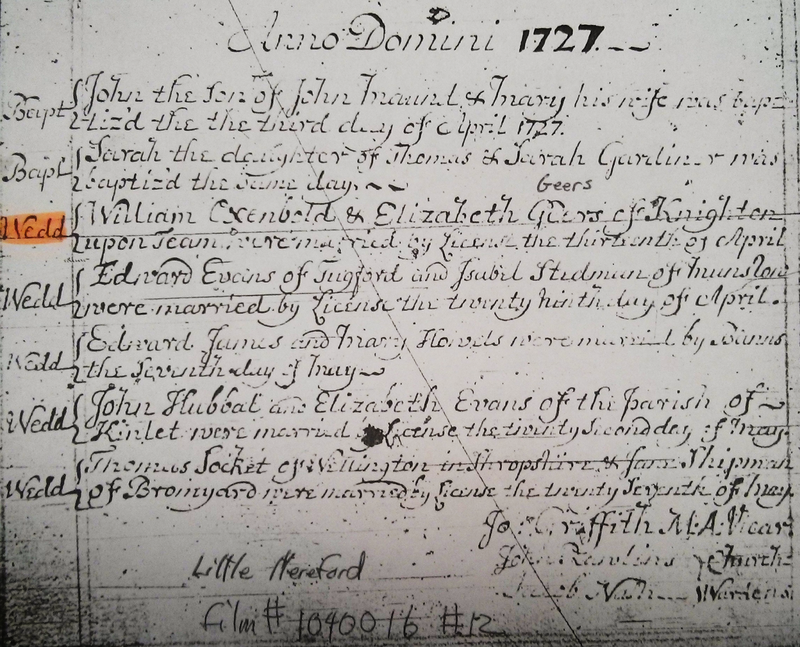 Looking back over the preceding 5 years, we found 2 other Christenings between a William and Jane, and then the death of Jane and both of her children in 1725. We surmised that William had become a widower (upon the death of Jane) and had remarried a few years later to Elizabeth. To prove it we needed to find a marriage record between William and Elizabeth. There was no marriage record for William and Elizabeth in Knighton-on-Teme. Since it was very common for marriages to take place in the wife's parish, we also looked in the nearby parish of Lindridge where many of the Oxenbolds had been married but had no luck there either. 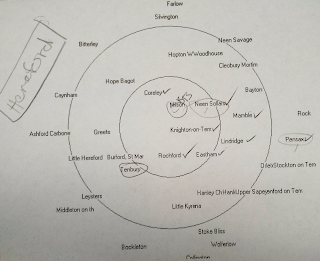 Next we tried manually compiling a list of nearby parishes, which was slow going until we found a little known program that would create a print out for us. That gave us about 35 parishes to work with. We were able to further shrink the list by determining which parish's had marriage records extent for the period of 1725-1728. 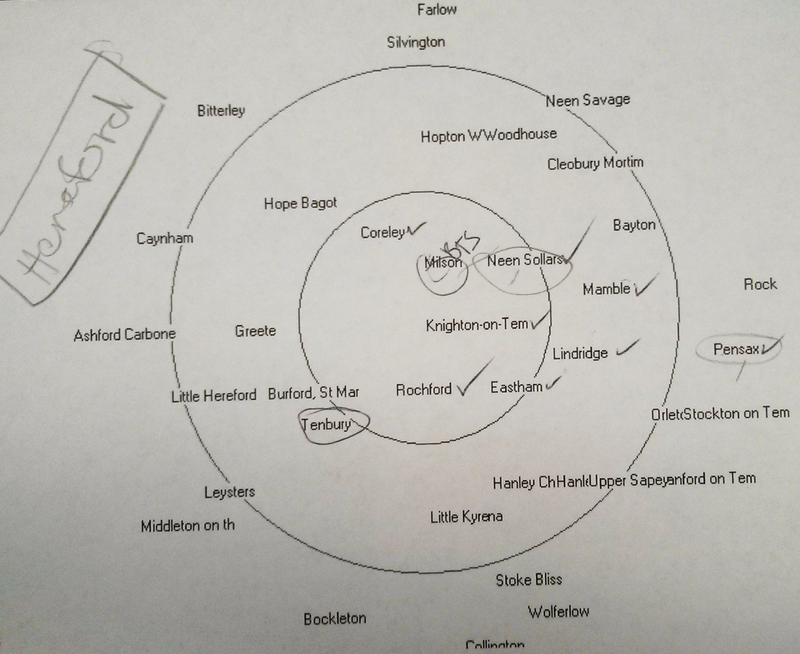 After looking at maps, Little Hereford was the likeliest candidate due to it's location just up river. A search of the appropriate microfilm revealed what we were searching for: "William Oxenbold & Elizabeth Geers of Knighton upon Teme were married by License the thirteenth of April ". After going through that process I began wondering why there wasn't a service that would give you the list of microfilm to search. You would give it a date range, a geographic location, and the type of record you are looking for, and it would return a list of records to search for, including where the records are located. This would save an enormous amount of time by automatically generating a research plan. 10 years later I still haven't seen the service I envisioned, but I am finally in a position to create it. And while I'm creating it, I think I will make it available world-wide. And not just limited to microfilm. This could be an interesting development. Any reason for not naming the 'little known' product you used? -- From the diagram it looks like ParLoc. We didn't know what the program was called. A consultant at the Family History Library in SLC created the printout for John. But after looking at ParLoc, that's likely what the program was.